With pixels that can be individually controlled to achieve perfect black and infinite contrast, LG OLED TVs are a new category of television. LG OLED 4K TVs also support HDR, including Dolby Vision. OLED HDR delivers a stunning high dynamic range picture, including support for Dolby Vision content. Enjoy brilliant brights, and deepest darks for infinite contrast and rich color. Picture-on-Glass is made possible by a bold new approach to television design. The OLED module is applied directly to the glass back panel for a clean, ultra-slim profile. The unique pixels of LG OLED TV can switch completely off to create perfect black and therefore infinite contrast, resulting in a more lifelike image you can only get with OLED. LG OLED TVs display Cinematic Color with a color palette that virtually matches those seen in today’s high-end digital cinemas. Now the home theater experience is on a par with real theaters. 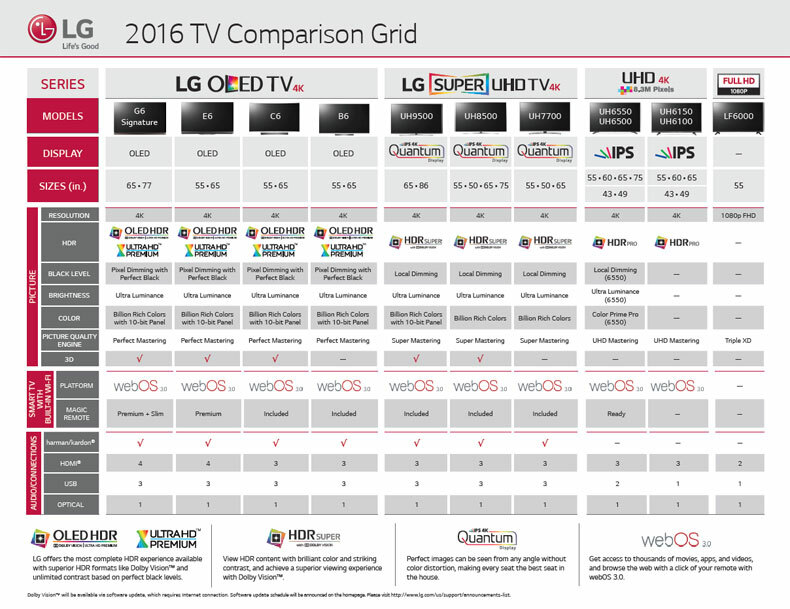 webOS 3.0 is the latest generation the acclaimed LG Smart TV platform, adding advanced new features while making it even easier to use. The user interface is more intuitive, mobile devices can connect in new ways, and now it’s more fun than ever to find and enjoy exactly what you want to watch. TV without Stand (WxHxD): 57.5" x 35.2" x 2.2"
TV with Stand (WxHxD): 57.5" x 35.2" x 7.9"
TV Shipping Dimensions (WxHxD): 63.0" x 40.0" x 6.9"